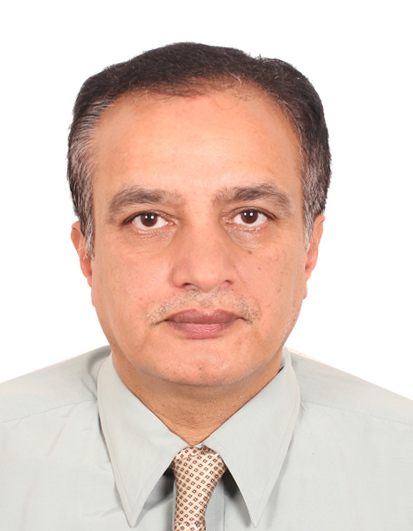 Mr. Thapa is a founder and life member of the Society and currently he is a member of the Executive Committee. He has completed his M.sc in Remote Sensing and GIS from G.O.U (India) and senior survey course from survey training center of Survey Department, Ministry of Land Reform and Management (Nepal). Mr. Thapa is a retired Colonel of Nepal Army. He has achieved several training courses related with military courses, surveying and GIS and Remote Sensing from Nepal and abroad. Some of them are unit navigator course at the School of Military Survey Royal Engineers (Great Britain), Map reading instructor course at the School of Military Survey Royal Engineers (Great Britain), Planning design and construction technique of highway tunnel for Nepal sponsored by Ministry of Commerce (China), Pacific unit 14-5 subject matter expert exchange joint base pearl Harbor-Hick am Hawaii (USA), Final meeting and course on Nepal air-borne Geoid project (Denmark). He has served MIO officer in Lebanon (UNIFIL). Before joining the Nepal Army he had worked at Survey Department of Nepal as a Survey Officer. After his retirement from regular service, he has been working as a visiting faculty at Department of Environmental Science and Engineering and at the Department of Civil and Geometrics Engineering, Kathmandu University. He is a Life Member and executive member of Nepal Remote Sensing and Photogrammetry Society. He is decorated with Commander-in-Chief Award of Nepal and UN Medal.